With the recent heatmap and national discussion about executive condominiums, it is hard not to keep an eye on them. Ecopolitan, a Punggol executive condominium is already open for buyers’ registration. To understand whether are you eligible for a executive condominium purchase, check out this comprehensive guide which is prepared by the Housing Development Board (HDB). Qing Jian Group has been in the construction business since 1952 and has huge exposure in mainland China and increasing its footprint in our local Singapore market and is the winning bidder for the latest Government Land Sales executive condominium plot at Woodlands Avenue 5. Not new to our local scene, the developer local accolades include Natura Loft at Bishan, Waterbay, River Isles, Riversound Residences and the fully sold NiN Residence at Potong Pasir. Its interesting to note that Qing Jian has 5 executive condominium plots which is an achievement recognition on making its presence felt. Look how close you are to the amenities around Punggol. 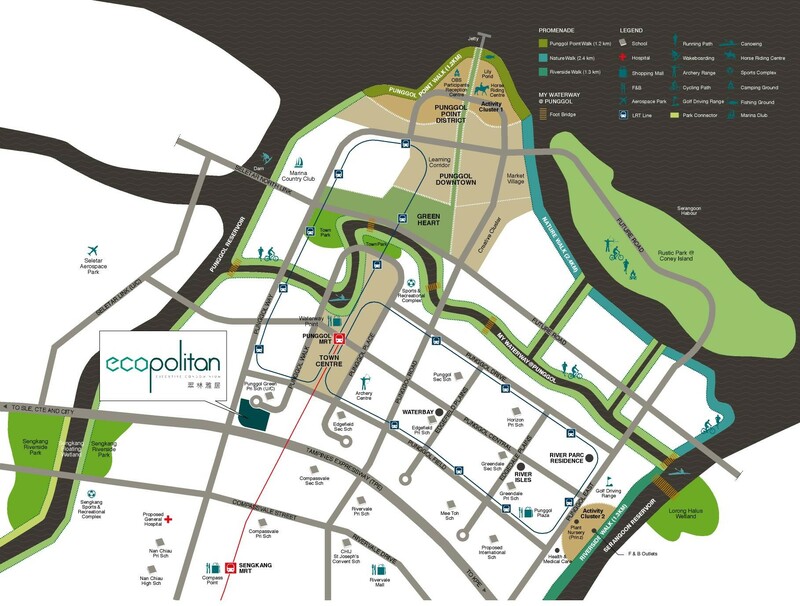 Ecopolitan is located next to Punggol Green Primary School, walking distance to Punggol MRT Station (about 680m) and the Punggol Bus Interchange (690m). As we understand Singapore Government’s emphasis on Punggol 21 plans, we already know some of the features have already been integrated. The lovely promenade is already up and running. You have loads of interesting activity areas especially unique to Punggol. The new executive condominium owners can also enjoy the Waterway Point megamall which is already under construction as its just walking distance away from their new enclave. Location is the key. Facilities is important. Things to look out for in a typical condominium would include the pool length, the type of facilities and whether a tennis court is present to label it a full facilities condominium. Ecopolitan fits the criteria with 50m lap pool, clubhouse with gym facing the pool and a tennis court tucked right next to the kids playground. For more artiste impressions of Ecopolitan. Studying the floor plans, it seems as if the developer is serious about giving space to the future owners. The layout is regularly laid, with no odd corners and functional spaces. There are rooms for creative plays as well if you would need extra functions in the apartments especially the 3 and 4-bedroom Co Space type where you have room to even cut an extra study, play room or whatever that fits into your habits. North-South facing for apartments is always a bonus as cross ventilation would be optimal. All apartments in Ecopolitan fulfills that prerequisite and are generally following the green concepts of BCA Greenmark requirements which allow future owners to save in utility bills whilst playing a part for the environment. Estimated pricing per square foot basis as quoted by the Developer would be between 760 – 780 per square foot (psf) on average. Attractively priced for a quality EC built. The developer has already started registering interest for Ecopolitan through SLP Realty, the sole appointed agency for this exciting executive condominium.